I think there are a number of factors relating to this lack of blogging motivation. My laptop is old and slow and frustrating to work on. My 9-5 job leaves me too tired at night to do much (and so weekends are busy trying to get everything else I want to do - the majority boring things I wouldn't necessarily blog about anyway). And I think the pressure I'm putting on myself to blog (because I love it so much) isn't helping either. So. I won't mention again how I wish I were blogging more regularly. I will be happy with any blogging, never mind consistency for now. We can always work on that later. 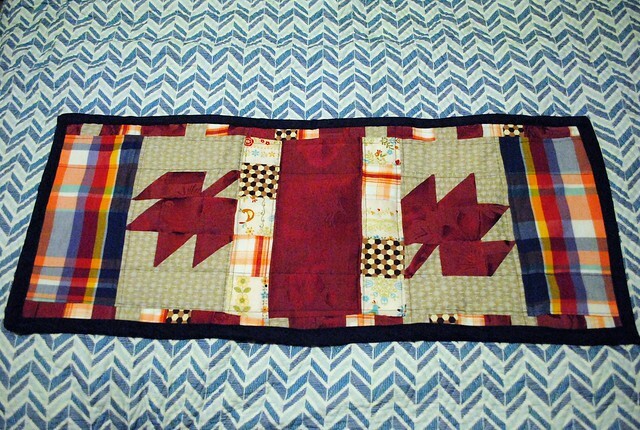 Anyway, onto some photos I've been meaning to show since Thanksgiving: the table runner I stitched up for my mom. She wanted it to fit the Giesler-boat-coffee-table as well as use up some of the scraps I cut off her fall / Thanksgiving table cloth (the gorgeous dark burgundy brocade fabric). 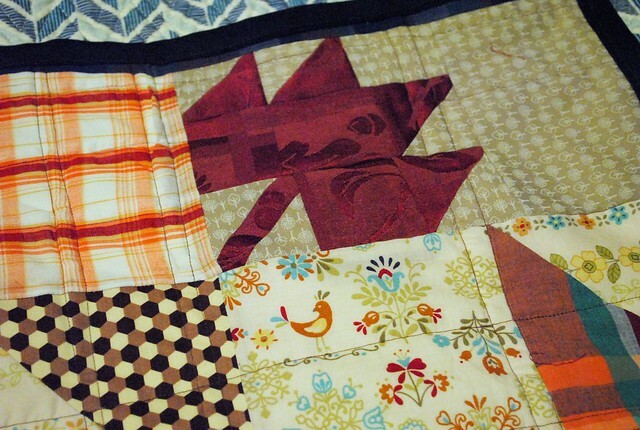 Oh - have I mentioned I've never quilted anything before? Yeah. 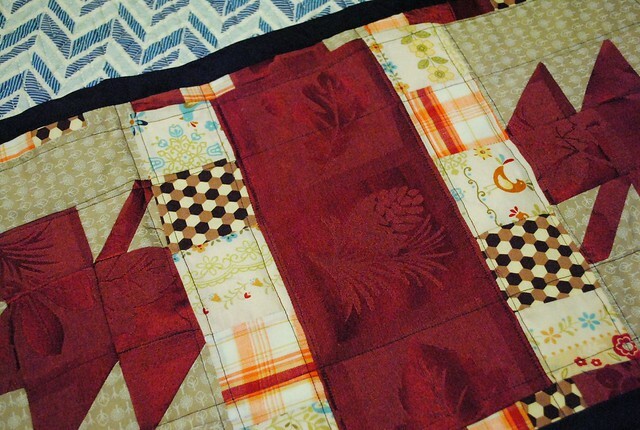 So I didn't want it to be too elaborate, but I still wanted it to be cute and reversible and to somehow incorporate a maple leaf block (my favourite). Essentially, I just jumped in head first. 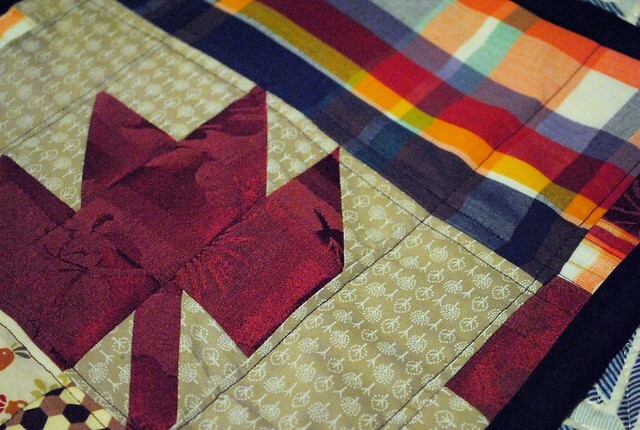 I didn't even really do any research online, besides looking up what the maple leaf block should look like. I made up a design on graph paper (and modified the "top" side since it was initially too complicated with a row of smaller leaf blocks - these larger ones being approximately 6"x6") and I cut everything with scissors because I don't have a cutting mat or rotary cutter, which made for some very crooked lines (and the addition of a few stripes around the edges to make everything line up and the proper size). I "padded" it with a few layers of an old sheet and finished it off with some store-bought navy binding. 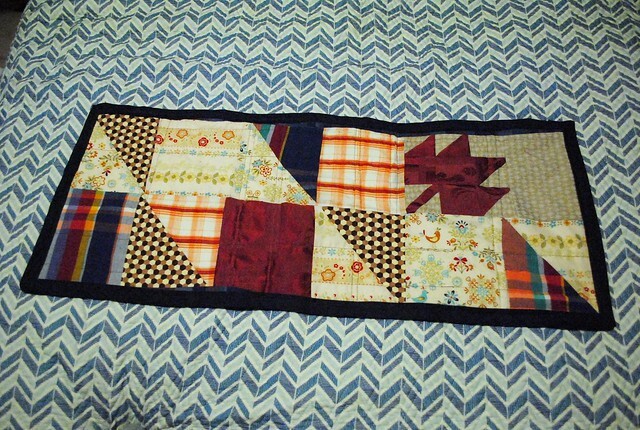 Overall, I'm really happy with how it turned out, especially as my first quilting experience. It would have been nice if things had been a bit straighter and lined up a bit better, but I love it for all its imperfections! I used some of my favourite fabric (see that bird above: My Folklore Japanese fabric, and those cute little trees on tan, from Fabricland), as well as a favourite neutral (Joel Dewberry Geo in Flax) and some bright plaids to tie them all together with a decidedly country feel (both from Fabricland). I also managed to sew my mom her pillowcase (from an old sheet, to fit a large, square pillow) and have been working on the Woodland Sampler. Stitch, stitch, stitching away over here! Now I think I'll upload whatever photos are on my camera and see if I can't find motivation for another post or two! We're super busy too, the list seems never ending: art work, x-ray job, online course - not to mention the new list of house to-do's: paint the upstair rooms, plant bulbs, trim trees, clean up our cut down tree...and then everyday duties....AND wanting to do seasonal stuff, pumpkins and baking too phew!